A new image leak on Google+ reveals a lot about what can possibly be Motorola's new Moto G5 Plus, including the majority of its key specs and features. According to the user who posted the image, the Moto G5 Plus will have an FM Radio and Digital TV. The SIM card size has been changed, as well, to nano SIM from the customary micro SIM card accepted on previous Moto devices. The Google+ user claimed that the unit he took a picture of is a test device for operators. It was previously believed that the G5 Plus will sport a 5.5-inch FHD display and might be equipped with a Qualcomm Snapdragon 625 processor with 4GB of RAM and 32GB of internal storage. The actual processor and memory configuration has not been revealed yet, but the display will surely be smaller. 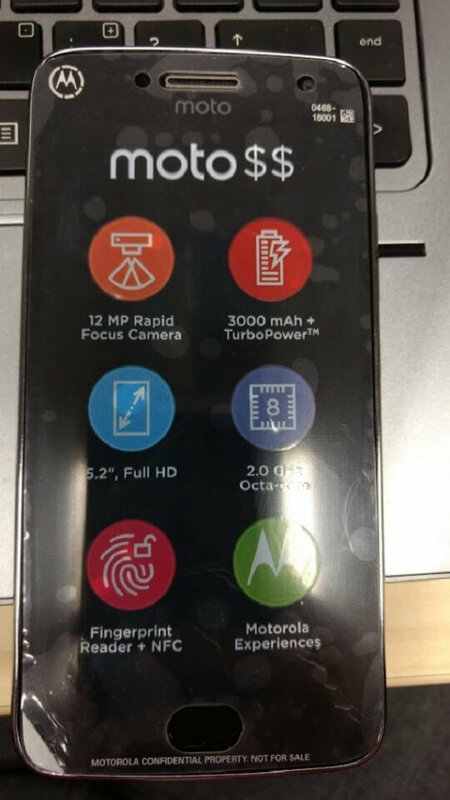 Based on the protective plastic film covering the display of the leaked image of the device, with a "Moto $$" sign above, the G5 Plus will have a 5.2-inch Full HD display, 2.0GHz octa-core processor, 12-megapixel rear camera with rapid focus, and 3000mAh battery with TurboPower. The device will also have a fingerprint sensor and NFC capability. The official release of the Moto G5 Plus, alongside the Moto G, is expected to be on February 26 just ahead of the Mobile World Congress (MWC) 2017 happening in Barcelona, Spain.